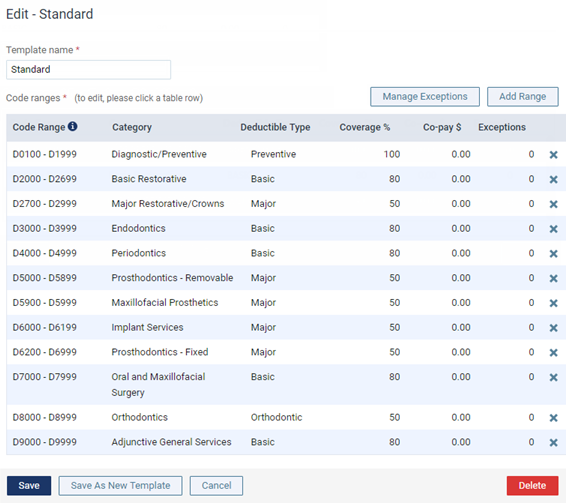 Dentrix Ascend has five default coverage tables, which you can use as templates for setting up the coverage tables of insurance plans. You can create your own templates for your organization as needed. Note: Coverage table templates are global (available to all locations across your organization). Create new - To make an all new coverage table template, click (or tap) New Coverage Table. Base on existing - To make a coverage table template based on an existing template, select the template that is similar to the one that you want to create. 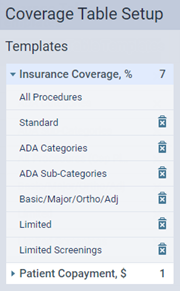 The options for adding or editing the coverage table template appear. The options that are available depend on whether you are creating a new template or making one that is based on an existing template. Type or change the Template name. A coverage table template's name must be unique. For an all new template, click (or tap) Save. For a template based on another, click (or tap) Save As New Template.